Together schools and local businesses support Key Stage 1 pupils to develop their literacy skills, raise aspirations and challenge stereotypes. 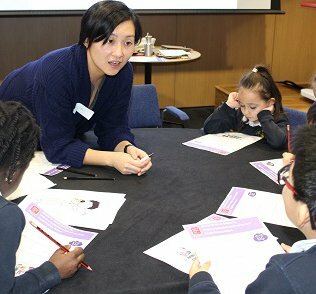 Words for Work: Dream Big develops literacy skills, raises aspirations and challenges stereotypes with children in Key Stage 1. Through a variety of interactive play and skills-building activities, the programme provides an authentic way to practise language and literacy. Words for Work: Dream Big helps young children imagine their futures and how they will use the skills they are learning at school when they are older. At the start of each programme, pupils visit a business and are sent on a mission to discover what life is like in a workplace. Follow- up activities take place back in the classroom with their teacher and are tailored to individual schools’ needs. The programme will be launched with primary schools in Birmingham, Bradford, London, Middlesbrough and Portsmouth. If you are a school or business based in these areas and would like to be considered to take part in Words for Work: Dream Big, please email us. 97% of teachers said that introducing children to the world of work can be very influential in broadening aspirations and bringing learning to life. 98% of teachers said introducing pupils to the world of work helped to challenge gender stereotyping about jobs and subjects. Gender stereotyping exists from the age of seven. We aim to help reduce gender-specific ideas about certain jobs by introducing pupils to a variety of careers. Less than 1% of children have heard about jobs through people from the world of work coming to their school.